Come and party with Worbey and Farrell, where four hands and one piano raise the roof. 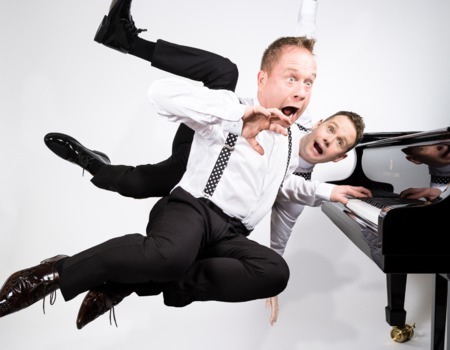 Following sell-out shows at Crazy Coqs and the Edinburgh festival, the internationally acclaimed piano duo bring their unique touch to the world's greatest music. Expect spectacular arrangements, original compositions and sensational piano playing. Revolutionary in their treatment of the traditional piano duet, they push the boundaries of the instrument using it to illuminate music of every style - classical, popular and contemporary. From Bach to Lily Allen, from reggae to Rachmaninov, the ingenuity of these amazing musicians makes you laugh and takes your breath away. Prepare to be moved, delighted and utterly gobsmacked. But above all prepare to laugh with joy at the sheer ingenuity and style of these two masters of musical mayhem.